Why Calif. Doesn't Want Smokers To Pay More For Health Insurance : Shots - Health News The federal health law allows states to charge smokers up to 50 percent more for a health plan sold through the new exchanges. But a bill moving forward in the California Legislature would prevent that from happening. Californian State Assemblyman Richard Pan (center) is the author of legislation that would bar higher prices for health insurance sold to smokers. Smoking has its risks, but in California higher prices for health insurance probably won't be among them. The federal health law allows states to charge smokers up to 50 percent more for a health plan, but a bill moving forward in the California Legislature would prevent that from happening. The Affordable Care Act is supposed to remove discrimination in the pricing of health insurance for things like gender and medical condition. Critics say a tobacco surcharge creates a new category of discrimination against smokers. Furthermore, a surcharge for smokers would mean they wouldn't get the benefit of the subsidy that's supposed to make buying insurance through the marketplaces in 2014 more affordable, says Karen Pollitz of the Kaiser Family Foundation. For a low-income person, a $3,000 subsidy makes affordable a policy otherwise costing $6,000. A tobacco surcharge would push it back up to $6,000, she says. If the state opted for the maximum surcharge, health insurance would become unaffordable for those with the lowest incomes, according to Rick Curtis, president of the Institute for Health Policy Solutions in Washington. And, he points out, it's that group that's most likely to smoke. "For somebody who is totally hooked after many years and older ... and those kinds of people are more expensive and often do need more medical care, they have two bad choices: go without health insurance and be impoverished that way, or get health insurance and be impoverished." The Centers for Disease Control and Prevention says tobacco use costs the nation about $190 billion in medical care and lost productivity each year. And that's exactly why Micah Weinberg, a health policy analyst with the Bay Area Council in the San Francisco region, thinks higher rates for smokers make sense. "If we're ultimately interested in bringing down the price of health care for everybody, including low-income folks, then we need to make sure we get a handle on unhealthy behaviors such as smoking," he says. Weinberg says higher insurance premiums for tobacco users — as long as they're not too high — provide the type of financial penalties that studies say cause people to quit smoking. By contrast, he says, banning higher rates because smoking disproportionately affects the poor reflects paternalistic policymaking that does nothing to fix the problem. "I think we have to be very careful what types of favors we're doing for people. Because if the end result of this policy is greater numbers of smokers, then that's not actually helping the populations that we're trying to help," he says. 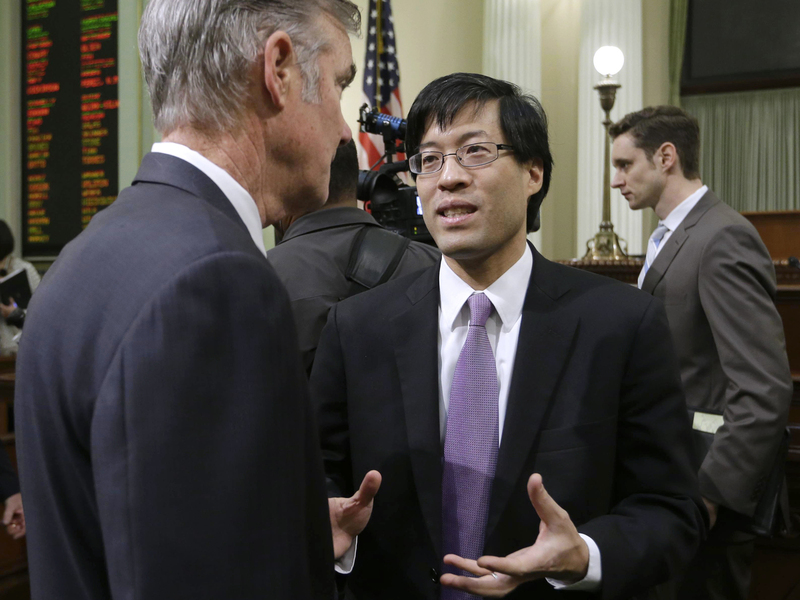 But California Democratic Assemblyman Richard Pan disagrees. He's a Sacramento pediatrician who wrote the legislation. Pan believes rate increases of any amount on smokers' premiums may dissuade some from buying health insurance altogether. "We want smokers to actually have health care coverage," he says. "And through having health care coverage they will have access to smoking cessation treatment as well as, of course, health care for not only smoking-related but even their nonsmoking-related illness." And for many in California, at least, that seems to make sense. Pan's proposed law has so far encountered no formal opposition from anti-smoking groups, cigarette companies, insurance companies or the American Lung Association. It's essential to provide tobacco users with affordable health insurance — rather than to make them pay more for it — because it's so hard to quit smoking, officials at the ALA's California branch said in a written statement. If the measure passes, California would join Massachusetts, Vermont, Rhode Island and the District of Columbia in making sure smokers aren't charged more under the federal law. This piece is part of a partnership with NPR, KPCC and Kaiser Health News.